After the long-long wait, Fahadh Faasil and Sai Pallavi’s film Athiran has hit the big screens today (April 12). After a gap of almost three years, the gorgeous Sai will be seen in a Malayalam movie. When the makers announced about Athiran, the Mollywood lovers were super excited as they were going to get to watch a new pair on the big screens. When the first poster was released, fans fell in love seeing the magical pairing of Fahadh and Sai and what they were looking forward was for the plot. When the trailer was released, it was surprising to see that it less of romance and more of psychological thriller. But the chemistry between Sai and Fahadh stood out and fans of these actors were just waiting for the film's release. Madhura Raja vs Athiran: Mammootty’s Film to CLASH With Fahadh Faasil-Sai Pallavi Starrer on This Vishu 2019? Athiran is surely a Vishu treat for all fans of Fahadh Faasil and Sai Pallavi. There have been various stills that released online and social media buffs just could not stop gushing over their chemistry. 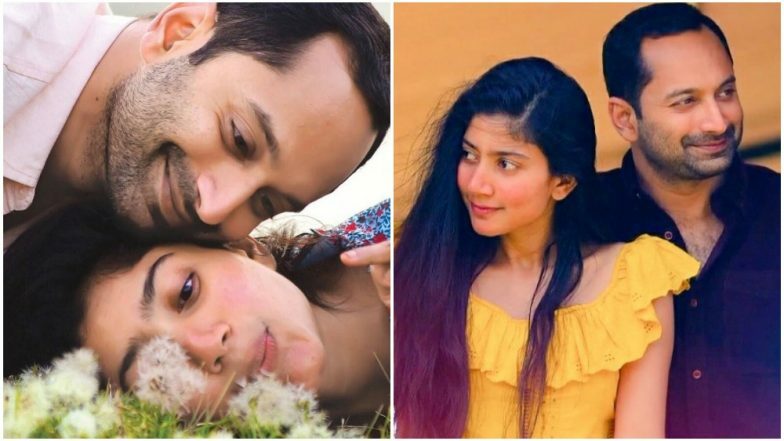 Sai and Fahadh looked absolutely adorable together in these pictures. Whilst many have already rushed to the theatres to watch the film directed by Vivek, many have even missed the opportunity. In cities like Mumbai and Bangalore, there is no show for Athiran and that has upset many fans. And all they are looking right now is at the details shared by the ones who are watching Athiran or have already watched it. But let’s take a look at the stills showing Fahadh and Sai’s adorable chemistry. Athiran: Fahadh Faasil and Sai Pallavi's Thriller Censored With U Certificate. Besides Athiran, the mass entertainer Madhura Raja starring Mammootty in the lead has also released today. It is a sequel to Pokkiri Raja and the film has received praises from the audience and critics. Let’s see whether it is Athiran or Madhura Raja that rules at the box office.